Over a 30-hour period on September 26-27, 2009, an eruption occurred on the Sun. Carried by the Sun's changing magnetic field, a filament, also known as a prominence of hot gas rose from the star's surface. The event was observed <http://stereo.gsfc.nasa.gov/img/stereoimages/movies/Filament_both_ed_best.mov> by NASA's Solar Terrestrial Reflection Observatory (STEREO) <http://stereo.gsfc.nasa.gov/> mission. STEREO consists of twin spacecraft that orbit the Sun, one spacecraft ahead of the Earth and the other following behind. The spacecraft that trails behind Earth captured the image on the left, and the spacecraft that travels ahead of Earth captured the image on the right. The pictures show ultraviolet light; the hotter the temperature, the brighter the light. Although the gas in a prominence is unimaginably hot by human standards, it is actually cool compared to the Sun's surface. Compared to the mottled yellow of the surface, the filament looks dark. The prominence is more conspicuous in the right image, where much of the gas appears in profile. Viewed against the blackness of space, the prominence appears orange. The orange color is especially bright near the Sun's surface, but fainter wisps of orange also appear farther from the star. This prominence was one of the first that was large enough for both STEREO spacecraft to observe it for hours. Filaments are held in place by magnetic fields driven by electrical currents. The fields form loops near the Sun's surface, and cold, dense gas fills the loop. Most of this gas eventually falls back to the star's surface as the filament collapses, but powerful solar eruptions can send particles all the way to Earth. 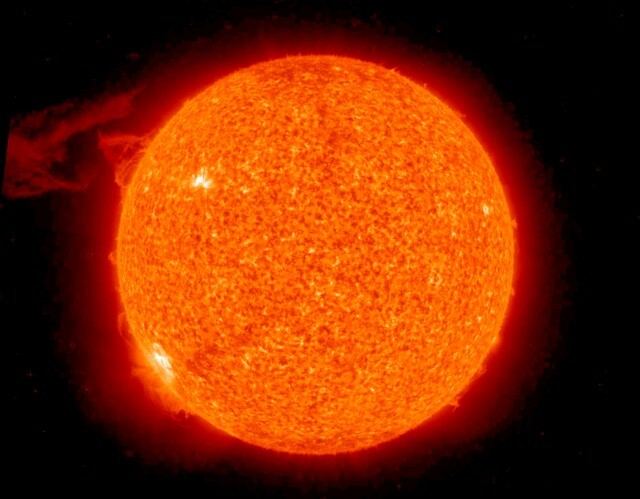 This prominence spans only part of the Sun's disk, but it easily dwarfs our own planet, whose size relative to the Sun is shown by the small white dot at the lower right of the STEREO Ahead image.